JOHN J. TRAYNOR III, P.E., P.L.S. 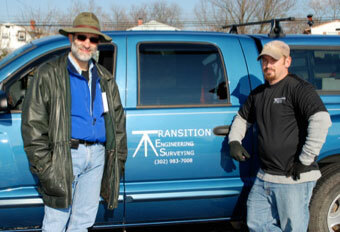 Mr. Traynor has 38 years of experience in engineering and land surveying. His responsibilities included directly managing, overseeing, and supervising an engineering division, a land survey department, a civil engineering department, and their respective projects and jobs. His work engagements over those years included Mann-Talley Engineers & Surveyors Inc., Tetra Tech Inc., and ForeSite Associates Inc. He formed a new company, Transition Engineering Surveying LLC on January 1, 2010 and has been successfully practicing consulting engineering surveying including setting up, “modernizing”, expanding, and streamlining surveying operations. His applicable general experience includes preparing major and minor record land development and subdivision surveys and plans, site plans and profiles, plans for drainage, hydraulics and hydrology, stormwater management and water distribution, sanitary sewer design, grading, design of pavement sections and street improvements, land planning, quantity determinations and takeoffs, boundary, land acquisition and disposition, control and topographic surveys, flood delineation surveys, and descriptions for conveyance. Software usage includes Autodesk AutoCAD Civil 3D, LDD, HYDRO+ (detention), Carlson Survey 2017 (SurvCADD) with SurvCE Microsoft Office 2016, Visio, Visual Basic 5 and 6, Access databases, command line DOS and batch file programming, building and troubleshooting computer and network systems, and automation. Outstanding niche achievements include automating surveying operations collection of field to finish data with Carlson Survey and AutoCAD Civil 3D, building standardized drafting with “white papers” for preparing surveying mapping and drafting according to streamlined AEC National Drafting Standards, competitive aerial mapping, implementation of SDSFIE drafting, and legend color banding for cut/fill and topography. Field experience includes directly overseeing or hands on conventional surveying including property, topography, control, geodetic, GPS, construction/field engineering, precise and general layout, and as-built work, including highway engineering. Managerial duties have included job coordination, communications with other consultants, attorneys, corporate firms, and city, county and state planners and officials, supervision, direction, and instructions to field personnel, draftsmen, and other engineers and checking, sealing, and approving plans. His engineering surveying experience with hazardous waste sites, landfill sites, industrial clients, treatment facilities clients, companies and agencies, residential and commercial developers and clients, attorneys, local, state and federal agencies, included planning, engineering, preparing, establishing, overseeing, supervising, or managing precise geodetic control surveys; facility management plans and edits, grid coordinate and elevation systems, utility, wells, and gas extraction system surveys, settlement monitoring, monthly surveys for volumes and density, aerial topographic mapping and digital ortho-photo compilations, spot aerial photography, base map topography and edits, quality assurance, existing conditions, intermediate and final surveys; cell constructions, cell and landfill cap closures, modeling volume determinations, hazardous waste surveys, hazardous waste remediation design, remediation cleanup, and landfill cap closures. His office experience has evolved from traditional drafting of engineering surveying plans to developing streamlined field to finish procedures maintaining traditional site drafting standards and conventions that landscape architects, civil engineers and planners crave. In summary, Mr. Traynor’s integrity, reputation, creativity, superior management, and technical skills are top notch – deserving to the client that expects engineering surveying value.